Magento 2 Delete Account extension allows Magento customers to remove their account and delete the details permanently from Magento 2 store. Delete account requests from customers My Account section. Account deletion Email confirmation sent to customers for enhanced security. EU's GDPR introduced in May 2018, giving the rights to customers to protect their personal information by request store owners to modify or entirely delete the details. Magento 2 stores must abide by the EU's GDPR law and thus process the request of Magento 2 customer account delete. 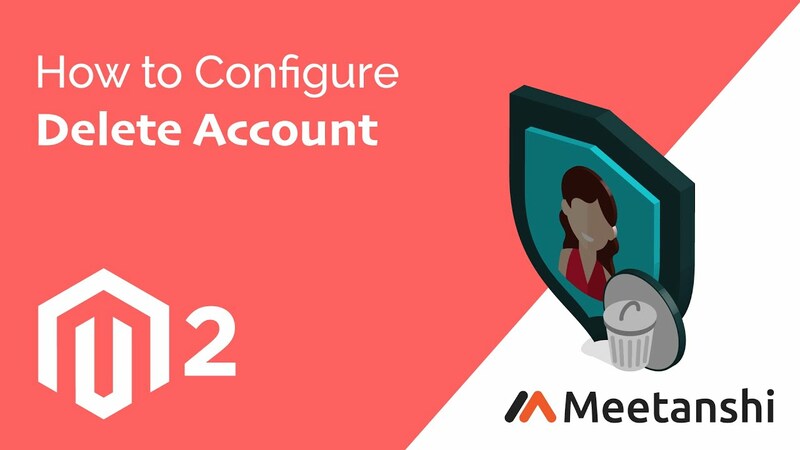 To ease the process, Meetanshi has developed Magento 2 Delete Account extension that lets Magento 2 store customers easily delete their account permanently. The Magento 2 Delete Account is a must have extension that not only allows customers to directly delete their account but also makes the admin free of ticket handling process to accomplish the Magento 2 delete account action. The customers can remove their account by checking "Delete My Account", submitting button from My Account section and then confirming account deletion fthe rom link in Email received. As the Magento 2 customer account delete action does not take place until the confirmation from this link, it provides a security layer for the customers. No one else than the customers themselves can delete the account! Admin can enable or disable the extension from Magento 2 backend. Admin can set the Email sender and select template for delete account confirmation Email sent to customers. Two-stage verification process for Magento 2 account deletion for enhanced security. If you want your Magento store to comply with EU's GDPR rules, use our Magento 2 GDPR Extension. Reduced my task as store admin!